Like Beer? Busy February 3? If you answered yes and no to those questions – in that order – then I have two events you won’t want to miss. 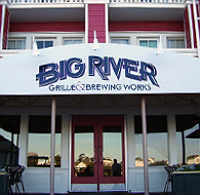 The first takes place at Big River Grille & Brewing Works at Disney’s Boardwalk Resort. What? You didn’t know there was a brewpub at Disney? Yes, there is and it’s really good beer, too, due to the fact that it’s run by the same company that owns Gordon Biersch Brewery. This Thursday, February 3, from 2-6pm, Big River Grille will be tapping their newest creation, Spiced Hefeweizen. It’s described as a German-style wheat beer spiced with coriander and orange peel. During the event, guests can get $2 pints of the new beer. A short drive away, in Dr. Phillips, the recently opened World of Beer will be hosting the Orlando Weekly’s party for the release of the February 2011 issue of their popular Drink magazine. From 5:30-8pm, those in attendance can enjoy complimentary Shipyard beer, and Thursday’s are also ladies night, so if you’re female, it’s a good night to go to World of Beer for this event. The Dr. Phillips location is at The Marketplace at Dr. Phillips (at the corner of Sand Lake and Dr. Phillips Blvd). The creative beer fan could even time it so it’s possible to attend both events.